What better way to start the Christmas season then to join friends and neighbours to sing traditional Christmas carols in the setting of a magically lit Victorian park. The weather may be cold, but the feeling that you will be left with after this evening will warm your soul! SOULINBRENTFORD invite you to ‘Carols in the Park’, a community celebration on Monday 17th December, 2012 at St Paul’s Rec, Brentford. The event will start at 6.30pm as guests arrive to a festive-lit park and are welcomed with mulled wine, hot chocolate and mince pies. 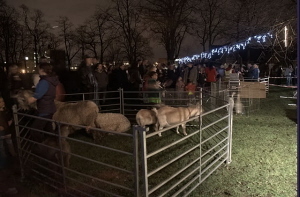 Live music will be playing as guests visit the different animals from the nativity story (being provided by Millers Ark). As people leave, they will be given treats and invitations to other Christmas activities being organised by the local churches. Join in on Monday 17th December, at 6.30pm (finishes at 7.30pm) at St. Paul’s Recreation Ground, St Paul’s Road, Brentford (behind Morrisons).